- Minimum 50,000/- Ad amount to be used every month under Annual contract. 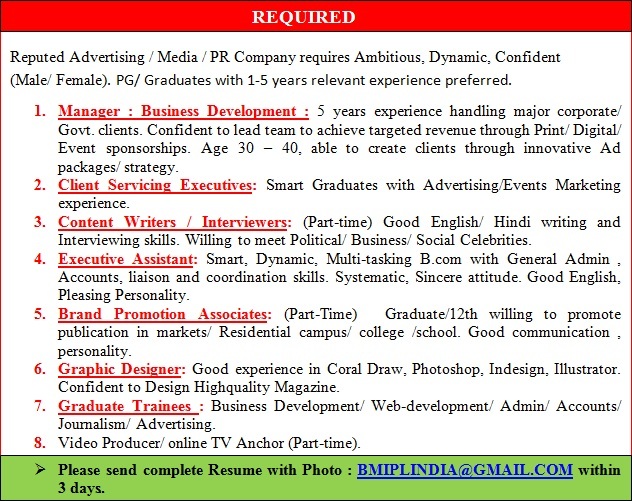 - Single Ad Should be minimum Rs. 15,000/- under monthly contract. - Ad will be released only after clearance of the cheque. - Appointments | Walk-in Interviews in both online and Print Media. Welingkar's vision is "To nurture thought leaders and practioners through inventive education". This requires maintaining a fine balance like the maestro heading an orchestra, fine tuning individual excellence to produce collective creativity, delivering masterpieces. Welingkar along its joumey to becoming an institute of excellence globally is always looking for professionals with this rare ability. Accreditation is key to scaling the Institutes practices and processes while continuing to maintain its uniqueness. We are looking tor a General Manager - Accreditation whose role broadly involves overseeing the institute accreditation goals. It involves, planning, aligning and executing all activities and processes required for international and national accreditations. The position requires you to take initiative, nurture and lead associated persons and teams, work with internal and external accreditations. The position pequires you to take initiative, nurture and lead associated persons and teams, work with internal and external experts. The positon will require mature handling of various categories of stakeholders and working on tight timeframes. Excellent communication skills and ability to use Informational technology effectively is a pre-requisite. Previous experience in leading or managing accreditation processes at management institutes, connect with the accreditation community would be valued. Doctorate / Post Graduate with 10-15 years of sound exprience in teaching/industry/research/quality assurance or a fellowship of an acclaimed Institute. BE OUR BRAND AMBASSADOR ? WORK WITH US AS CITIZEN REPORTER / READER RELATIONS OFFICER ? 1. You would be required to meet & interview Jhuggi dwellers to officers, Entrepreneurs, Social Activists & celebrities of the city. 2. Report the activities happening in your area with photograph. 4. Coordinate Educational, Social awareness, Cultural activities & contests. 5. Should be able to spare 2-3 hours daily. Suitable honorarium will be payable per month. Bungalow -35 , Navdoorsanchar Colony,Palash Parisar, E-8 gulmohar Bhopal-462039..
A. 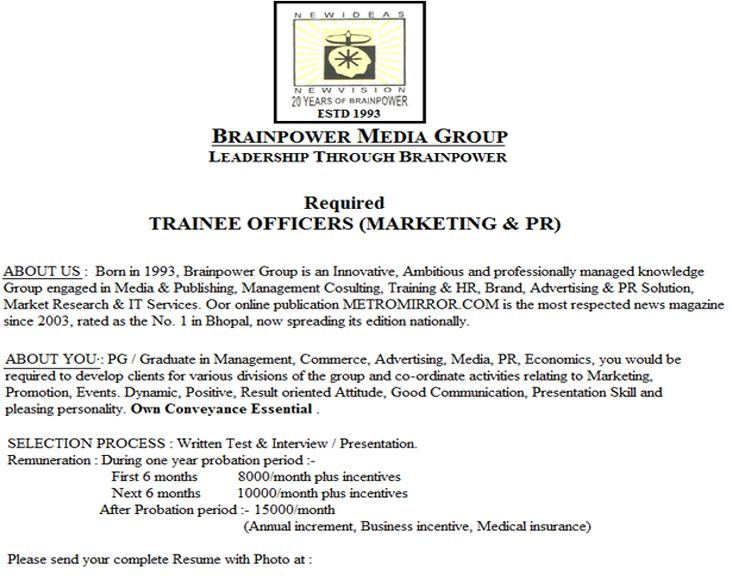 Business Development : Level : Head / Manager / Executives, 1-7 years experience : services / concept Marketing . B. 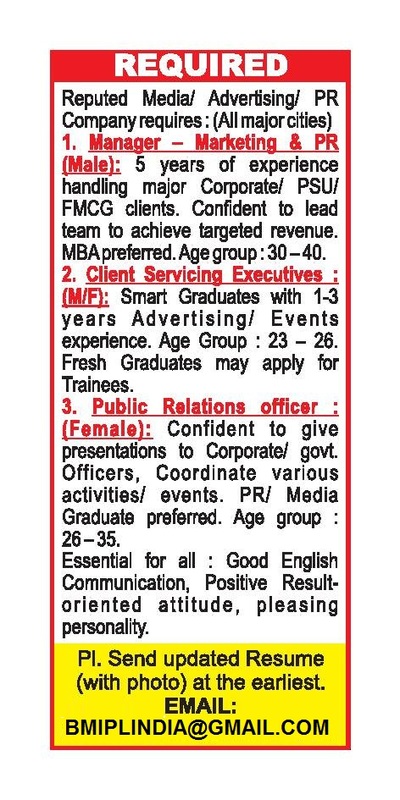 Public Relations Officer : Should be able to work as the Eyes, Ears & Mouth of the group, meet top officers for building image, discuss tie-up proposals. 2 years relevant experience. 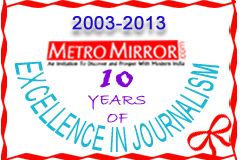 BMIPLINDIA@GMAIL.COM , VISIT WWW.METROMIRROR.COM / Appointments.